I love easy recipes, especially ones the boys can do themselves like these Halloween donuts! You can experiment with different faces and colors. In a microwave safe bowl melt your chocolate in 20 second burst, stirring in between each burst. Dip your mini donut into your melting chocolate giving a swirl to ensure it is coated well. Fill a shallow bowl with black sprinkles. 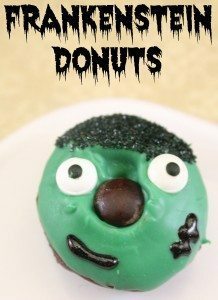 While the chocolate is still warm, dip the top of your donut into the black sprinkles and add your candy eyes and brown M&M. Place in the refrigerator to allow chocolate to set.